Welcome to the second installment of our Show Me Your Style! Today we introduce you to Mrs. Christy Haudrich, Regional Manager, and member of the Glik’s team for 20 WHOLE. Same story goes, we sat her down at this year’s 2012 Holiday Regional meetings and asked her to share a bit about herself with us. Christy: I am a mother of two wonderful children– I like to dress on the conservative side yet keep up with fashion trends. Me: I agree, keep it classy for the kids, yet sassy in terms of style. Me: I’m going to give you a situation: You’ve just spent the day transitioning your wardrobe from summer over to fall. What would you say is the most dominant item in your closet? Christy: I’m definitely a fan of the sweater. My closet is full of cardigans, oversized sweaters, and sweater dresses. They’re a perfect add-on to a comfy pair of boots and dark wash jeggings. Me: Speaking of Holiday 2012, there are so many fun trends for this season. What is your favorite trend right now? Christy: My favorite trend is jeggings with riding boots and an animal print top. Just add a scarf or some fashion jewelry for a complete look! Make some room neon! Pastel has made its comeback. Now the bold and bright electric shades have to share the spotlight with soft and demure hues. Pastels are being sighted everywhere this summer from nails to shoes, jackets to jeans, and tops to dresses. Pastels are even being featured in home décor and the interior design scene. I really love pastels right now, and why shouldn’t I? Think of all the fab styling possibilities that come with soft feminine hues like lavender, mint green, cotton candy pink, sky blue, peaches & cream, and saturated coral. Pastels + Neutrals: Trying pastels for the first time? Ease into this trend by pairing your pastel tinted skinnies with an otherwise casual outfit. By pairing a color with neutrals you don’t overpower the look and can slowly ease into this trend. You can opt for an extra contrasting pop of pastel with fun accessories or painted nails. Pastel & Print: What I like about pastels is that they can give a feminine touch to a bold print or pattern. A pair of leopard print shorts looks fun when paired with a dainty mint pastel tank and fashionable flip-flops! It’s all about Layers: Not new to the color trend, but you’re ready to spice up your style a notch? Make a statement when you wear a contrasting colored bottom like the Flying Monkey jegging in coral with a pastel patterned top. Layer, layer, and layer some more. You can start with one pastel piece, and then you can add more as you gain confidence! 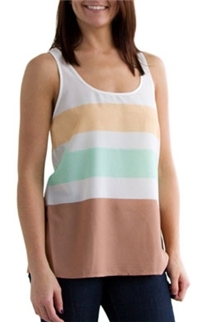 Pastels are perfect for a feminine springtime look and will continue through the summer. Be sure to keep an eye out for chic new pastel apparel arriving daily at gliks.com or you can visit your local Glik’s store location to find your perfect pastel piece! The new HOT trend this year is leopard print. It lets you stand out from the crowd and show off your wild side. Celebs sporting this trend and showing their spots everywhere. There are many different ways to wear leopard prints. The one thing to remember that when it comes to animal prints, or any bold prints for that matter, less is more. For example, leopard print makes the perfect accessory in a pair of pumps, a handbag, or a scarf, but you can have too much of a good thing. Stick with only one leopard print accessory. Leopard print can also be hot in a dress, pants, or a top, just make sure to pair it with simple yet fab accessories, such as black combat boots or pumps, or a simple top. Check out how these celebs style their leopard print. Miley Cyrus, Christina Aguilera, Vanessa Hudgens and Rihanna show their spots. Dying to get your hands on this fab trend? 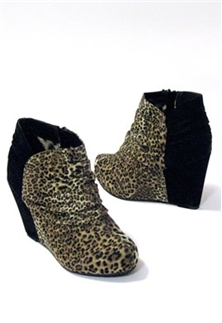 Pick up these Dollhouse Zatty Gathered Suede Leopard Booties from Glik’s! What do you think of this trend? Do you love it? What’s Hot in the LA Boutique on Gliks.com! Glik’s online LA Boutique has tons of hot trends for summer! From maxi dresses to animal prints, we have it all! This black maxi dress has a cream crochet back and straps. It’s a good maxi dress for summer because its cream and black, making it able to go with any color sandals and accessories. Wearing this color with a primary color like red or blue would make it the outfit pop! A huge trend that’s been everywhere for the past few seasons is animal print! Leopard has been the most popular of all the animal prints and has been on everything from shoes, clothing, and like this cuff above, jewelry. This cuff is covered in diamond like jewels and is the perfect trendy accessory for summer. This bracelet can take a simple black, white, or red dress to the next level. Speaking of Leopard print… these shoes are totally wild. With a cork wedge and a braided satin toe these wedges are quite a statement. This zebra print scarf is also part of the animal print trend. Who says you can’t wear scarves in the winter? A thin summer scarf can set make a simple summer outfit (shorts/tank or denim mini/cami) fabulous. Floral was huge for spring and is staying strong for summer. This floral chiffon top by Mine Code can be easily dressed up or dressed down. For a day time look you can wear it as shown above, with capris and sandals. To make it more night time, you could wear it over a tight black cotton pencil skirt and pumps. This pink candy cane striped dolman stop screams summer. Dolman shirts are super hot this year and this one is no exception. Wear with some denim capris or shorts, maybe even a mini, and some black or brown sandals. To view any of these items in the online store, just click on the picture!